Sunday day drinking is not for the faint of heart and is usually best enjoyed by the 21-40 year old single, no family, alcohol, fun loving population. I basically described people who are not my parents. After a Sunday afternoon BBQ at Alex's bar, the husband, some friends and I all decided to head over to the Pike for more drinks. Mid Bloody Mary, in walks in a older Asian couple. 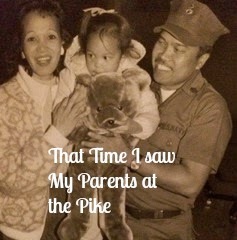 My first reaction was why are my mom and dad at the Pike? Now, these people were not my parents, nor did they really look like them, but I guess it's the Asian thing and oh yeah we're at the PIKE. The bar that pours well drinks so strong, that has it's own unit of drink strength measurement called the Pike Pour. Oh yeah, there is never a Saturday Night at the Pike where I remember ever going home. They, of course, order the fish and chips. I say of course because they are Asian and that's what mom and dad would have ordered. They also ordered a side of rice. I knew they would because when my parents ate at Chick-Fil-A for the first time I asked them If they liked it. My dad's response was, "It would be better if they had rice." Don't get me wrong, the Pike is a restaurant and occasionally families are seen here but remember, this couple reminds me of my parents, non fun having home bodies. It was weird seeing an older Asian couple sit down and look at the menu. It was weird seeing my friend that works as a server help said couple navigate the menu. It was weird seeing them order beer. Because of the association with my parents, it made me uncomfortable. But really I haven't lived at home for more than ten years, what if my parents go to restaurants and order beer? I wouldn't know. But I like to think they don't. Before they left they were asking the server for pizza recommendations the server recommended Pizza X 2. And with that, I have come to the conclusion that "my parents" smoked weed and the association between my parents and this Asian couple ended.